I first visited Sault Sainte Marie in the early 1990’s with two friends and fell in love with the rapids instantly. In my travels with The New Fly Fisher TV show, I’m often asked to name the best fishing spot I’ve ever been to. Without hesitation, I point to the Soo rapids. This statement still has merit, as the rapids of the St. Mary’s river are truly a fly fishers Mecca. What was true in 1920 is still true today, as this is a unique and almost perfect fishery, featuring steelhead, Atlantic salmon, pink salmon, chinook salmon, brown trout, resident brook trout and even whitefish. My most recent trip targeted migratory salmon, and I was not disappointed. Huge schools of pinks were in, along with the occasional Chinook. Pink salmon, also known as the humpback salmon, were unintentionally introduced into the Great Lakes near Thunder Bay in 1956. 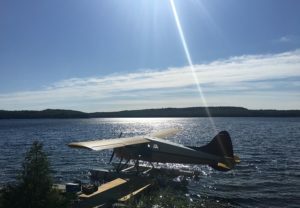 The population has maintained itself since then, slowly growing in numbers and spreading to much of Lake Superior and Lakes Huron and Michigan. Sault Sainte Marie, or “The Soo” as it is nicknamed, is located on the St Mary’s River in Ontario. Across the river is its twin city of Sault Sainte Marie, Michigan. The two cities are connected by the International Bridge, which crosses over the rapids and locks. Great Lakes shipping bypass the rapids by using the American Soo Locks, one of the world’s busiest canals. Pleasure craft use the locks on the Canadian side of the rapids. The main industry in the Canadian Soo is Algoma Steel, which brags that it is the most profitable steel company per unit on a global scale. 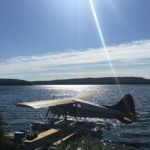 Tourism is also a profitable industry, offering top notch accommodations, shopping, a Casino, train tours through the Agawa Canyon, and a picturesque boardwalk that follows the harbor front. Celebrities such as the first Canadian woman in space, Roberta Bondar, along with NHL hockey players Phil and Tony Esposito hail from the Soo. You can only access the rapids from the Canadian side and your first impression is intimidating. The St. Mary’s River flows from Lake Superior into Lake Huron. The actual rapids cover less than a mile. Here, the river bottom is bedrock, boulders, rubble, gravel and sand (perfect spawning grounds for fish) and are divided in two by a cement dyke that runs the whole length. Inside the dyke is quite wadeable water, with pools, runs and riffles. On the far side of the dyke are the main rapids, with many channels, rapids and runs. There are also three large pools, which are prime holding spots for fish. The largest and most productive of these is the Canadian Pool. Finding fish is not a problem in the rapids. Seek out submerged rocks where fish shelter from the current. Seams where currents meet, as well as deep runs, are also prime places to find fish. Fish will hold in the slower water as close to the fast water as they can get. Fish also hold in the tail outs and surprisingly close to shore or the dyke. Large pools in the rapids are prime hot spots. As the depth drops off suddenly in these pools, caution is urged when fishing them. Another drawback is that they’re popular places to fish and can get rather crowded. 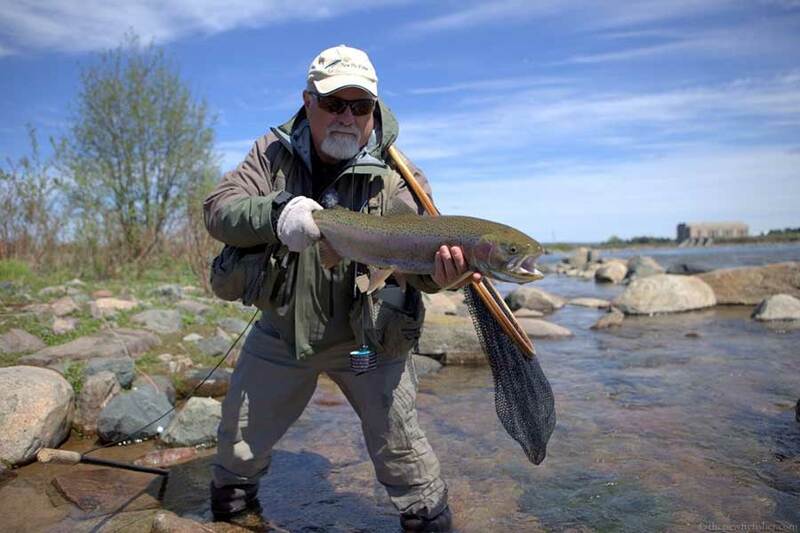 The Rapids can be dangerous, and wading fly fishers need to take the appropriate precautions. Studded felt soles on your boots or Korkers are highly recommended. Make sure you use a waist belt to cinch your waders tightly in case you fall in. Wading staffs are also a must, as in spots the current is strong and treacherous. A personal floating device is also a good idea, especially if you choose to wade deep. As depths can change from a foot to six feet in a couple of steps, waders should proceed with considerable caution. 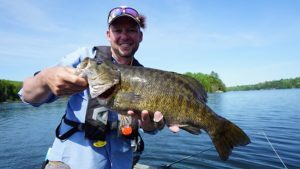 Fortunately, deep water wading is not really needed, as most of the good fishing is close to the dyke and the wading there is relatively safe. Polarized sunglasses are a must, as most of the fishing is sight fishing. 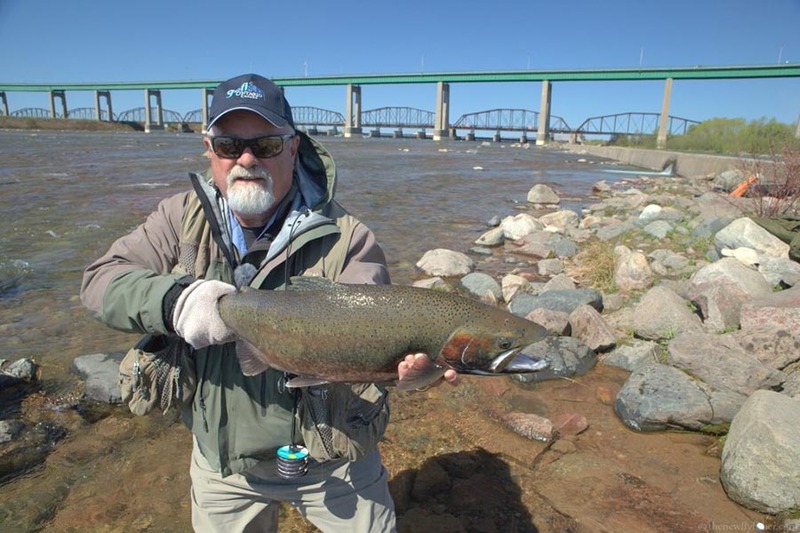 As fish encountered in the rapids during the fall can run all the way up to 30 lbs, it’s essential to use equipment robust enough to handle the big ones. My recommendation is an eight weight nine foot rod, which even a pink of five pounds will put to the test. If you are fishing in the springtime for steelhead a seven weight outfit should suffice. In both cases, the rod should have a medium to stiff action with enough backbone to turn a fish around in the current. 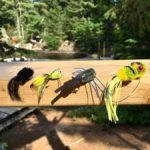 Large arbor reels with smooth drags and a capacity to hold large amounts of backing are recommended, for once a fish gets into the current it can strip off 100 feet of line and backing in seconds. The strength of these fish is incredible. A smooth drag will help you control the run and the larger arbor will allow you to pick up line quickly—a necessity when a salmon runs toward you. 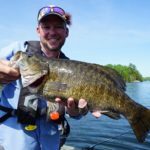 For the most part, a floating line works well, as most of the water you will fish will be no more than four or five feet deep. Simply lengthening the leaders is usually all that is needed should you encounter water somewhat deeper. However, there are three much deeper pools in the main rapids which are best fished sinking tip lines or sinking leaders. A standard nine foot leader is sufficient most of the time. However, as the water is gin clear, fish become spooky when the sun is high. In these conditions, it pays to lengthen the leader to prevent fish from seeing the fly line. Constant inspection of your leader is important, as the bottom has many sharp rocks which can damage it. The clear water and line shy fish of the Rapids demand light tippets. Monofilament should be no heavier than 6lbs test. Although this results in more break-offs, the increase in hook-ups more than make up for it. With fluorocarbon, which is virtually invisible when under water, you can go heavier—up to 10lbs, which gives a huge advantage when fighting big fish. However, fluorocarbon necessitates extra care in tying knots, especially lubrication with saliva before cinching it down tight. Dead drifting a nymph under an indicator is very effective in the Rapids. On a standard nine foot leader place the indicator approximately twice the depth of the water from the fly, with a split shot at the knot tying on the tippet—approximately 14-16 inches from the fly. 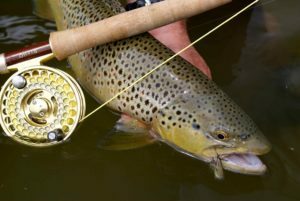 Use only enough weight of shot to take the fly to the bottom and still allow it to tumble naturally and drag-free in the current. As water conditions vary considerably, it’s necessary to change the weighting frequently. Make short upstream casts, and keeping the rod high to lift the line off the water, follow the line downstream with the rod tip at the same speed as the current. This enables the controlled dead drift essential for success. Presentation is far more important than the fly pattern used. Cast close to you first, then after a number of casts take a couple of steps further out from shore and repeat the short casts and drifts. Repeat this until the water becomes too deep to go further. At this point, lengthen the cast, allowing the line to land on the water and control the drift with line mending. With a short line drift, without line on the water, hook-set is a simple lift of the rod. However, when drifting with line on the water, it’s necessary to change to a side striking motion. Set the hook at any movement of the indicator. It might be a rock, but it could be the trophy of a lifetime. If you’re not hanging up on the bottom every once in a while, your’re not deep enough. Swinging flies in the current Atlantic salmon style is also a good technique on the Rapids. 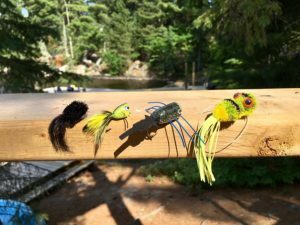 Use a sinking tip line or a sinking leader with only four feet of monofilament leader to the fly. You can use a heavier leader here, as the fly will be the first thing the fish sees. If the water is fast, add a split shot to the nose of the fly to make sure it sinks to the bottom. Start at the head of a run and cast downstream at a 45 degree angle. When the fly lands on the water mend the line upstream to allow it to sink. Then, lower the rod tip to the water and follow the line as it drifts through the run. After two or three drifts without a hit, take two steps downstream and repeat the procedure until you come to the end of the run—or get a hit, which can be anything from the line simply stopping, to an arm wrenching grab. As the water is gin clear, a stealthy approach is needed. You will be sight fishing most of the time, and that means if you can see the fish, they can see you too. The biggest mistake is failing to scan for fish in the water close to shore before wading in, for fish frequently hold there. If you fail to do this, you’ll be rewarded with the sight of your quarry bolting for the middle of the river. Early morning, when the sun is low and the fish are less spooky, is the best time to fish. It’s also good ploy to wade in the water close to the dyke and, using the dyke as cover, cast to holding water along the shoreline at the other side. However, if you have to walk along the dyke itself, make sure you keep a low profile and keep your shadow off the water. Worked with a drag free drift, this pattern in sizes 10 and 12 is deadly. Effective colours vary from light yellow, to white, to fluorescent chartreuse depending on the degree of water clarity dictating. This fly can be dead drifted or swung in the current. Sizes 8 to 10. This pattern is very effective swung in the current. Sizes 4 and 6. 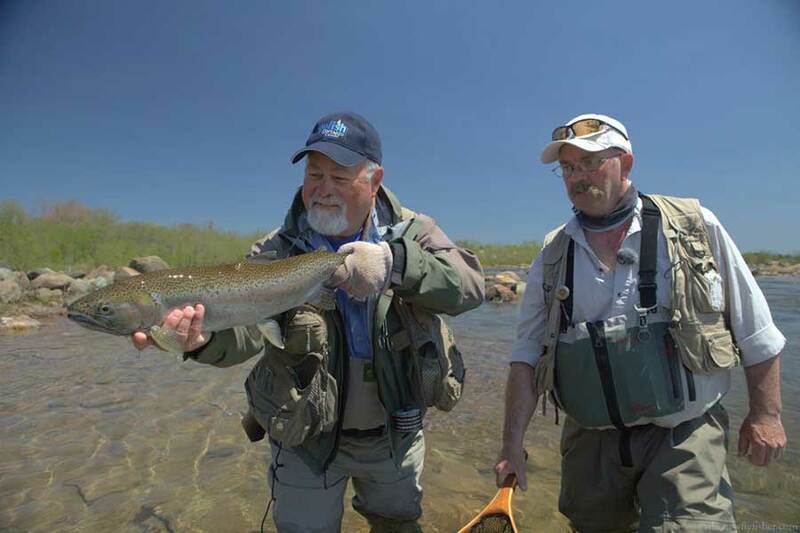 Steelhead: from May to June and October to December. Atlantic salmon: mid June through August. Chinook Salmon: mid September to mid October. Pink Salmon: late August through September. 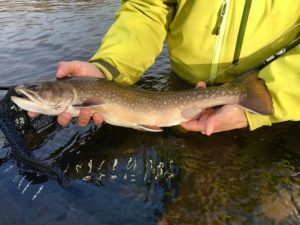 Brook trout: June to September. Resident rainbow and brown trout: year round.